The outgoing Independent National Electoral Commission (INEC) Chairman Professor Attehiru Jega was recently a guest of the Center for Strategic and International Studies in Washington DC. During a talk attended by Jega’s INEC Commissioners and Nigeria’s Ambassador to the United States of America Ambassador Adebowale Ibidapo Adefuye, Jega gave a very eye opening talk about Nigeria’s election landscape and the recently concluded 2015 elections. Jega said that Nigeria’s electoral laws caused operational problems for INEC. If a presidential election is inconclusive with no clear winner, the Nigerian constitution requires a second run-off election to take place within 7 days of the original election. Prior to the election INEC had recommended that this provision of the constitution should be amended. In other countries the average time to prepare for a run-off is 6 weeks. Jega described the possibility of organizing a run off election in 7 days as “impossible”. A run-off could have caused “a constitutional crisis”. He said he prayed the election would not go to a run off! INEC did what it could to prepare for the eventuality of a run-off; printing extra ballot papers just in case. Because of fear of being challenged in court, INEC printed extra run-off ballot papers for all parties (even though the law requires that the run-off should take place between only the two top parties). The permanent voter cards (PVCs) that voters used to vote were made in China. INEC met quarterly with party chairmen and representatives. Meetings became monthly in the run up to the election. Jega said that “Time will come when positive things will be said about Jonathan’s government” – in terms of allowing INEC to be independent. Jega said none of the electoral malpractice or attempts to affect INEC’s independence could be attributed to Jonathan or the government in particular. The postponement of the presidential election from February to April allowed INEC more time to train more staff and allowed more people to collect their PVCs and vote. As at February 28, tens of millions of PVCs had not been collected. In February INEC and Jega were invited to the office of the National Security Adviser (NSA) Lt-Colonel Sambo Dasuki for a meeting. The meeting was also attended by the military service chiefs Air Chief Marshal Alex Sabundu Badeh (Chief of Defence Staff), Lt-General Kenneth Tobiah Minimah (Chief of Army Staff), Air Marshall Adesola Amosu (Chief of Air Staff), Vice-Admiral Usman Jibrin (Chief of Naval Staff), and the Inspector-General of Police Solomon Arase. INEC were told that there were compelling reasons to postpone the election. The security chiefs told INEC there was “a window of opportunity” to fight Boko Haram and that their energies would be focused on that fight around the time the election was scheduled. They said that for the first time Nigeria’s neighbors Chad, Cameroon, and Niger were pressing Nigeria to join a Multi-National Joint Task Force (MNJTF); whereas in the past it was Nigeria that was pressing them to join a military coalition, and they foot dragged.The security officers said that joint action against Boko Haram would rob it of the ability to flee for respite to Nigeria’s neighbours. The security chiefs said that the time was opportune because the military had just taken delivery of military weaponry they had ordered before. In conclusion the armed forces could not provide their customary level of security support for this election. INEC were taken by surprise. Their position was that they were ready for the elections to go ahead as scheduled. INEC asked the service chiefs to undertake consultations and build consensus for their recommendations. The following day the NSA Dasuki went to Chatham House and recommended a six-week postponement of the election; without consulting INEC. https://maxsiollun.wordpress.com/2015/01/26/nigeria-national-security-adviser-not-very-optimistic-about-chibok-girls/ In the words of Jega “we were shocked” by Dasuki’s speech and candor at Chatham House. Although Dasuki’s Chatham House speech took INEC by surprise, INEC could not publicly contradict the NSA. The following week Jega and INEC were summoned to a National Council of States (NCS) meeting (also attended by the service chiefs) at which Jega briefed the NCS and told them about the situation (INEC was ready to go ahead with the election as scheduled, but had received security advice to the contrary). Jega also received a letter from the NSA Dasuki (signed by the Chief of Defence Staff Badeh) reiterating the earlier security advice given to INEC. The service chiefs and the NSA reiterated to the NCS that they could not provide security guarantees for the election. The decision on whether to postpone was deferred to INEC since it was INEC that had the legal mandate to schedule the election. Jega said the discussion at the NCS “took a partisan divide” (with some parties for and against postponement depending on their assessment of whether or not it would benefit them). INEC called a meeting of its commissioners. Jega considered the safety of its electoral staff and said he “would not put the lives of over 750,000 election workers at risk” by ignoring the security advice. INEC did not want to be blamed for bloodshed if it ignored the security advice and lives were lost. Postponement also offered INEC a silver lining by allowing more people to collect their PVCs and vote, giving them more preparation time, and offered the potential for a genuine and peaceful elections to take place in Adamawa, Borno, and Yobe States which had been wracked by the Boko Haram insurgency and which were so insecure that it was difficult to envisage how elections could take place in those states. As at February, INEC had produced 68.95 million out of 69 million PVCs that were supposed to be produced. 67% of people had collected their PVCs. By the time the election took place 56 million PVCs had been collected out of a total of 69 million PVCs (81% of PVCs were collected). INEC received petition to cancel Rivers State election results on the grounds that fake result sheets were being distributed and that no elections took place at all in certain polling units. Jega said these claims “were spurious”. INEC sent a three man team of its national commissioners to Rivers State to investigate. The commissioners were there for 12 hours and refuted the petition’s allegations. All Jega said is that he “Hope we learned lessons from that and move on…statesmen should be statesmen…we need more role models”. Jega said Nigerians should not spend so much time in euphoria of the election success, but should also focus on maintaining standards and preventing regression. Said Nigerians “shouldn’t just sit back and gloat about a wonderful election”. INEC used NYSC cadets as ad-hoc staff. NYSC and security staff did not get to vote because of their election day duties. Jega said they had tried (after 2011 election) to arrange for ad-hoc staff to vote but INEC did not get around to implementing it. Jega said perhaps essential election staff could vote 1 day or 1 week in advance of the public. INEC piloted an electronic results system in 2011 – using the governorship election in Rivers State as its test case. INEC worried that technology failure or manipulation would taint the election. Result technology had failed in Kenya. INEC felt they already had too much on their hands with the introduction of PVCs and biometric readers. He also said that using an electronic counting system required trust in the technology, and faith it would not be manipulated. Jega said that level of trust does not yet exist in Nigeria’s political system, and that the possibility of technology being manipulated or corrupted, led INEC to count results manually. Jega gave credit to Jonathan’s government for giving INEC approval and money to implement PVCs and electronic card readers. She is related to Nigeria’s late Minister of Defence Muhammadu Ribadu. She describes her upbringing as that of “a normal northern girl”. She used the word “indomitable” to describe herself. She comes from “a learned family” with 4 or 5 professors in the family. An article I wrote for the UK Guardian’s comment is free section. Two things are virtually certain, no matter who wins. The results will be disputed and there will be litigation (especially if the result is close). All the talk about the upcoming February 14 presidential election Nigeria is about President Goodluck Jonathan and Muhammadu Buhari. However there are 12 other candidates contesting this election! Goodluck Jonathan is the Presidential candidate of the Peoples Democratic Party (PDP). He is the incumbent President and is seeking re-election. Jonathan assumed office in 2010 after the death of former President, Umaru Yar’adua. He was elected into office in 2011. Muhammadu Buhari is the Presidential candidate of the All Progressives Congress (APC). The former Head of State contested for the office of President in the 2003, 2007 and 2011 elections. He emerged the candidate of the APC in December 2014 defeating opponents which included former Vice President, Atiku Abubakar. Tunde Anifowose-Kelani is the Presidential candidate of the Action Alliance (AA). He was born in Agbokojo, Ibadan, Oyo state, on April 5, 1965. He earned a first degree in Guidance and Counselling combined with Communication and Language Arts from the University of Ibadan and a Master’s degree in Personnel Psychology from the same university. Sam Eke is the Presidential candidate of the Citizens’ Popular Party (CPP) and is also its National Chairman. He is an accountant and a native of the Ikwuana Local Government Area of Abia state. 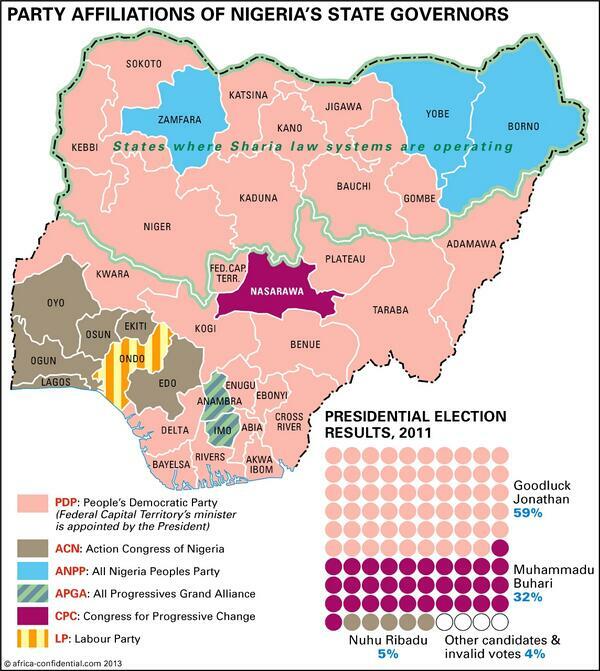 This is a very good visual showing political affiliations in Nigeria on a map. This colour coded map shows which states are governed by Governors of the ruling PDP, and which are governed by opposition Governors. Video of an event that took place on Tuesday December 9 at Chatham House in London. Zainab Usman and Olly Owen of Oxford University along with Professor Kuna of INEC.